In the night of May 11-12, 2004, as CAELESTIA's project coordinator decided to take a last look at the night sky through the top-floor window of his home, he was taken aback by three blinding lights that moved fast in his direction. When the lights had arrived at a distance of no more than 50 metres from the window, they swept away to the right where they came to a stop. It took a few moments to realize that the lights were part of a construction crane used for the restoration of a nearby building. 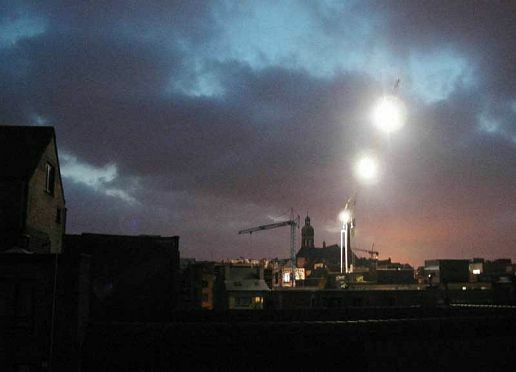 Apparantly, a contractor had decided to place the crane there during the evening and have his men work all night to make a deadline. The picture was taken the next evening, using an Olympus C-200 ZOOM.